I take a lot of photos - sometimes hundreds over the course of a week. I enjoy this hobby but occasionally, I get over-whelmed with what to do with them, especially in relation to wanting to post relevant photos to the blog or facebook. Scrapblog to the rescue! I use a website to help create scrap book style pages that can capture a bunch of photos in one small space, in order to convey what I want to show and say, without having to do too much work. 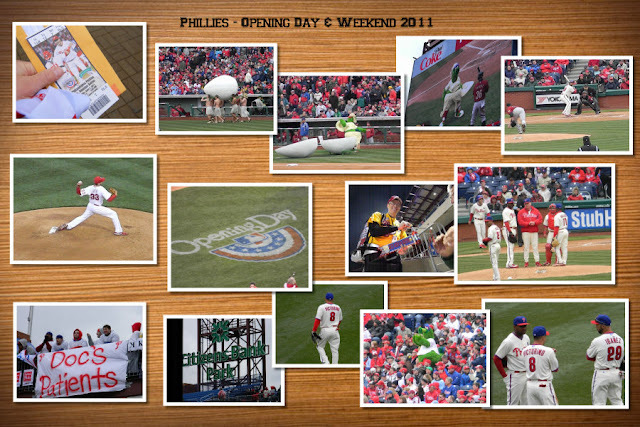 The Phillies opened their season on April 1, 2011. 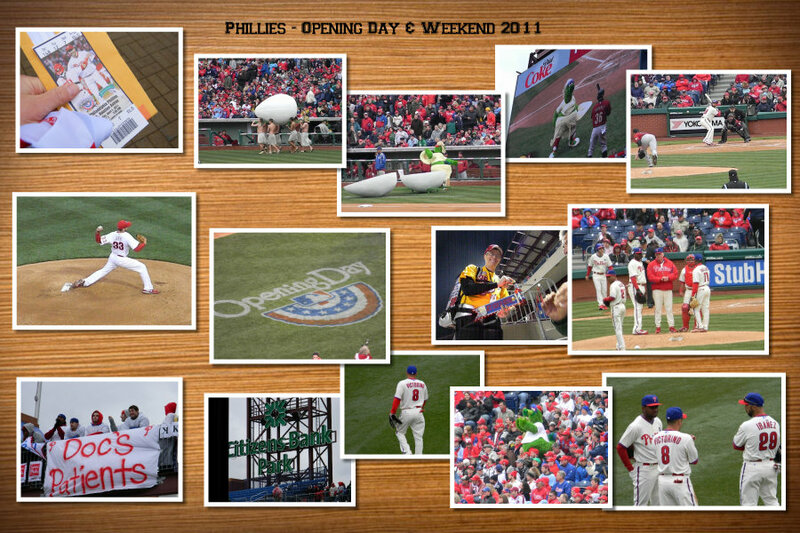 We had tickets to Opening Day and to the first night game at Citizen's Bank Ballpark. Great series and the boys played great baseball. Swept the Houston Astros and put to rest some concerns that we were all pitching and no hitting or offense. It was yet another cold, blustery April weekend. There are few opening day wins that I can remember in the nearly 20 years I've been going on Opening Day. There are even fewer warm opening day games that I've attended. Scarves, hats, gloves, layer upon layer of clothes and coats and sometimes, blankets, are thin barriers against the winds blowing in off the river and open areas of the sports complex. This year was no exception. We were so cold at Friday's game, sitting out in center field, we had to leave by the end of the 7th Inning. Well, the cold was one reason and the other was that Liz had to get to work for a show she had running that evening. We missed the incredible rally the Phils mustered - turning a disappointing game into a nail-biting walk-off hit in the bottom of the 9th inning success. Saturday night's game was even colder, coming off the warmer and sunnier day. I didn't dress in enough layers. We left this game by the end of the 6th Inning. This time, though, the Phillies were playing great ball immediately and winning the game by several runs. There 162 games in the regular season and I'll be at 18 games, minimum. Welcome Spring and Welcome Back Home Boys of "Summer"! I'm so happy for baseball season!!! HOpefully we will get to a game soon. We went to Clearwater in March, but didn't really get to see the game... the little one was hot, annoyed, tired, and teething. I saw 2 batters!